WizLine Toolbar might be installed onto your computer without your permission because this browser plug-in is distributed via unreliable installers together with adware and other malicious applications. Therefore, if you ever notice its presence, you should remove WizLine Toolbar as soon as possible. Unfortunately, it is impossible to do that via Control Panel, so there is a possibility that less experienced computer users will face some difficulties regarding the removal of this software. If you are one of those who have no idea how to get rid of it, you should definitely read through this article in order to find more information. Even though WizLine Toolbar will allow you to access auction websites and search for the information straight from your browser, you should still not keep it installed on your computer because this browser plug-in is untrustworthy. The specialists at pcthreat.com have found that WizLine Toolbar will modify your search results, so it is rather risky to search for the information via this toolbar. Keep in mind that you might be taken to unreliable places on the web if you click on any of those suspicious links, so we believe that the cleverest solution is to delete WizLine Toolbar from the system. It is not worth installing WizLine Toolbar on the system not only because it will provide you with ads and third-party links, but also because it installs TR/Dropper.Gen. infection on your system without your permission. It might download and install malicious programs on your computer. According to our security experts, you might end up with adware or even much more serious threats. Thus, do not forget to eliminate TR/Dropper.Gen. from the system as well. Unfortunately, you might encounter similar unreliable applications in the future as well, so you should not forget to install an antimalware tool on your computer. In order to make sure that your PC is fully protected, you should keep your security application enabled all the time. As has been already mentioned, WizLine Toolbar cannot be deleted via Control Panel. Luckily, we are here to help you to eliminate this unwanted software from the system. You have to follow our manual removal instructions step by step or simply scan your PC with an antimalware tool, such as SpyHunter. We recommend using this security software because it will not only remove all the existing infections, but will also protect your PC from other threats that might enter your system in the future. Tick a box next to Delete personal settings. Launch your browser and then open the menu. In the dialog box, click the Reset button. 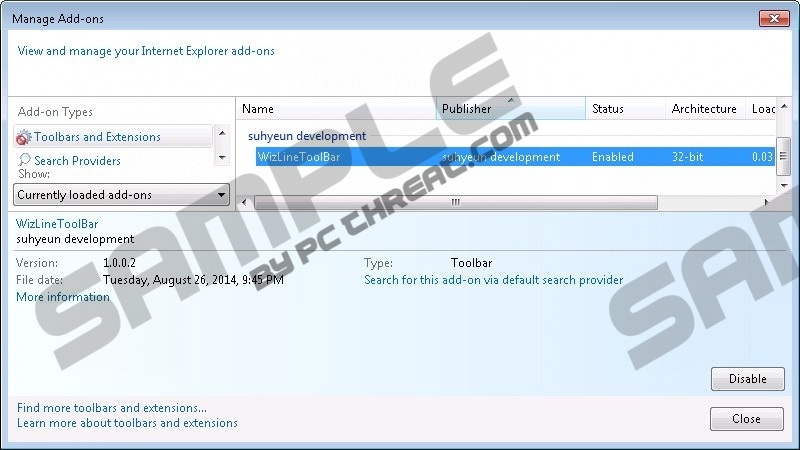 Quick & tested solution for WizLine Toolbar removal.